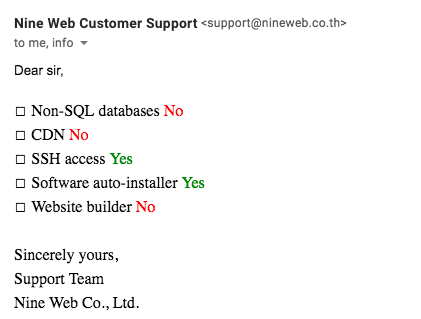 Nine Web Review 2019: Is Nine Web a Good Hosting? Nine Web is a long standing Thai website hosting provider. You get a lot of options with this company, as well as a good uptime guarantee, but the beginner friendly features are minimal. Nine Web has been providing hosting services since 2000. 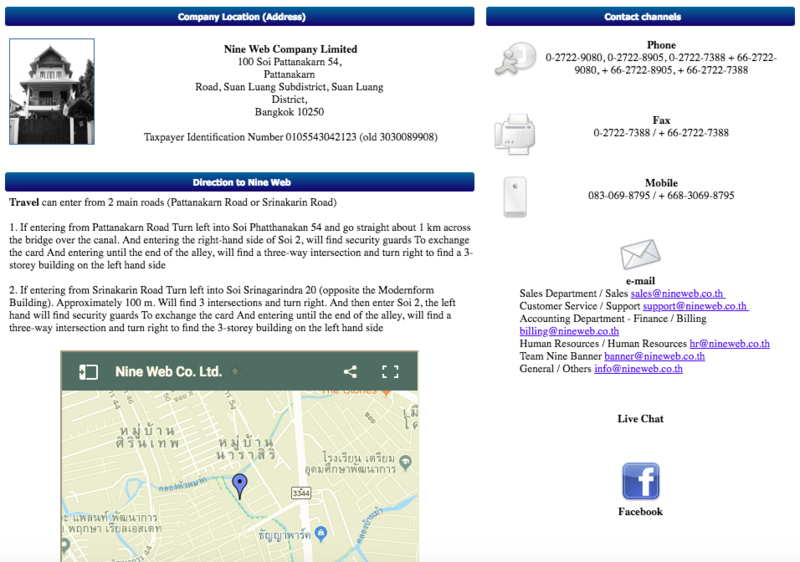 A long standing company, it is based in Thailand, with a website in Thai (there is a link to an English version of the site, however, it was not working at the time of this review). You can choose between Windows and Linux operating systems, as well as servers located in either Thai or U.S. data centers (both options mean the servers are co-located), which is quite flexible for a shared hosting company. It’s hard to tell what the uptime guarantee is as there isn’t an SLA displayed on the website, and there are various different percentages advertised depending which page your read, ranging from 99.9% to 100%. All of the usual features for expert users are included, for example, plans come with unlimited FTP accounts, MySQL and Microsoft SQL databases, phpMyAdmin, and support for PHP, albeit far slower version 4 and 5. There’s even Cron jobs to schedule repetitive tasks easily, as well as SSH access. The situation regarding beginner features is less positive and after contacting support, I was able to confirm with customer service that there is a one-click installer, but not a website building tool. Surprisingly, the prices are quite high when compared to other local and international competitors. Even the base package with 200MB disk space (granted, it has unlimited domains and data transfer), has a premium price point. You do get a free domain when you purchase an annual plan, as well as an SSL certificate, which goes a little way to help. Plans can be purchased in three, six, twelve, and twenty four month terms, and there is a discount when you purchase a longer term upfront. While it’s not the smoothest checkout flow I’ve seen, unlike a lot of Asian companies, you can purchase and pay for the hosting entirely via the website. There are a variety of methods to contact support, if you need assistance. You can email various departments, including sales, finance, or general support, or phone or fax the company. 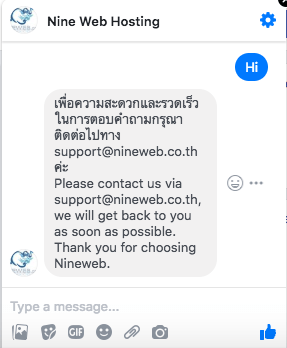 Ideally, Nine Web would add live chat (it is mentioned on the website, but it seems to direct you to Facebook messenger, which then tells you to send an email) and/or some form of help desk with articles to improve the customer service offering (there’s only a basic FAQ section). On the plus side, I sent an email at around 3:00 p.m. on a weekday and received a reply in English on the same day. The reply was brief but it answered all of my questions in full. Nine Web is a well established company specializing in cloud hosting and when you’re ready to scale, you can take advantage of its VPS and dedicated server plans. The plans have an uptime guarantee (a little vague) and support for many advanced level features, but the offering for beginners is a lot less feature-packed. 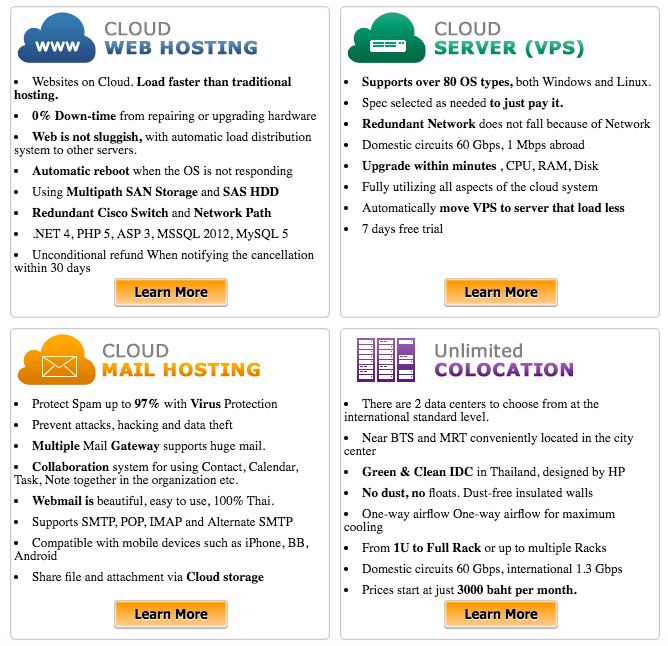 Wondering how Nine Web stacks up against other Web Hosting companies? Enter any other Web Hosting company and we will give you a side-by-side comparison.